Birds are a big part of our lives, our history and our ecosystem. They are free to soar in the skies, sit on your rooftop, and walk in your yard. However many of us hardly notice birds in our daily life (except for the unfortunate droppings from above). Early civilizations such as the Egyptian, drew birds as spirits and gods on tombs. Romans used the pattern of birds to determine the will of gods. Birds traveled between continents thousands of years before explorers found them. They migrate to different continents between seasons to find food and a better place to breed. In order to make this move easy, they usually travel in a V formation to decrease air resistance and make it easier for the flock to stick together. There are over 10,000 bird species in the world and they all have their own stories. While 925 species have been sited in the U.S and Canada, South America has the largest concentration of birds with over 3,200 bird species. 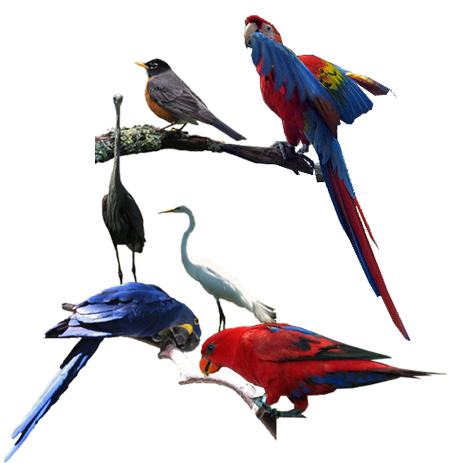 The study of birds is known as ornithology and scientists who study birds are called ornithologists. Birds attract mates, build nests, protect their territory and hunt for food. Birds play a large place in ecology, as they are an important part of the food web. Activity 1 – Amazing Birds! Did you know that you need to cook an ostrich egg for two hours to get a hard-boiled egg?? There is no end to learning more about birds. And here is another interesting fact! A bird’s heart beats much faster than our heart does. They need a strong circulatory system and a strong heart to fly. A hummingbird’s heart beats about 1,000 times a minute, whereas a human’s heart beats about 60-90 times! Like we said, every species has it’s own story. Impress your friends with ten or more interesting facts that you find about birds. In this activity, draw a food chain that includes a bird. See how important it is that birds have worms, seeds and grasses to survive. Label the participants in your food chain. What do you think would happen if the worms or insects were not available for birds to eat?What do you think happens if the worms and insects in the grass are poisoned by pesticides and weed killers? Bird watchers look at the plumage, or feathers, of birds, to help identify what type of bird it is. They also look at the size, color, call, nesting habits, etc. 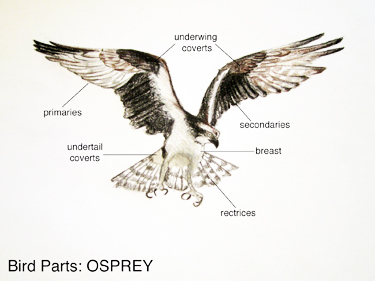 Using the Audubon’s Guide to the Parts of a Bird, make a pencil sketch of a bird of your choice. Using neat printing, label the five different plumage areas, markings of the head and bill (beak) parts. Go to the library and check out a bird guide. Using your location, find out what different species of birds live in your city. Now grab a guide, your binoculars and go to a park! Take a walk around and find five different species by using your guide. Take photos, do sketches in your journal and write down five interesting facts about each species. It is very easy to find and collect beautiful feathers once you start looking for them. Start your very own feather collection for fun. See if you can find different types and colors. Once you have collected at least ten feathers, use your guidebook to try and identify what bird it came from. Make an art piece or wearable jewelry item using your found feathers, paint or any kind of art supply. Share your work with your friends the classroom. Let the birds guide you! Look out a window. Walk to school and search the treetops. Walk along the river or in a park and listen for bird sounds. 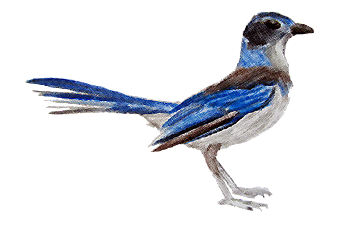 For one week, record with photos, sketches and notes how many birds you see. What can you learn from looking for birds? Seeing a bird will give us information about its size, coloring, markings, flying ability, social life, nesting and habitation patterns. Bird watchers observe the size and shape, color pattern, behavior, range, habitat, field marks, flight, songs and calls. Birds are amazing creatures that take long journeys during change of seasons. Watch different bird species migrate north in this interactive map by Cornell University! Now that you can see the migrations take a look at which species are where. Some birds that migrate south during the western hemisphere’s winter fly out over the ocean in a clockwise loop and then come north inland to take advantage of air currents. Many species fly the same paths year after year. Choose a species of bird and plot its annual migratory path. Check out amazing data of breeding areas, population location, habitats, and migration paths at Cornell’s e-Bird Status and Trends!! How many bird species are found in the U.S and Canada? What do birds need to fly? How many feather types do bird watchers look for? What is the study of birds?